North Island Choral Presents Brahms, Bach and Beethoven. North Island Choral Society will begin rehearsals on January 15th 2019 for the spring concert which will be performed at St George’s Church April 12th and 13th. Below is a short article which will appear in The Record in March 2019. 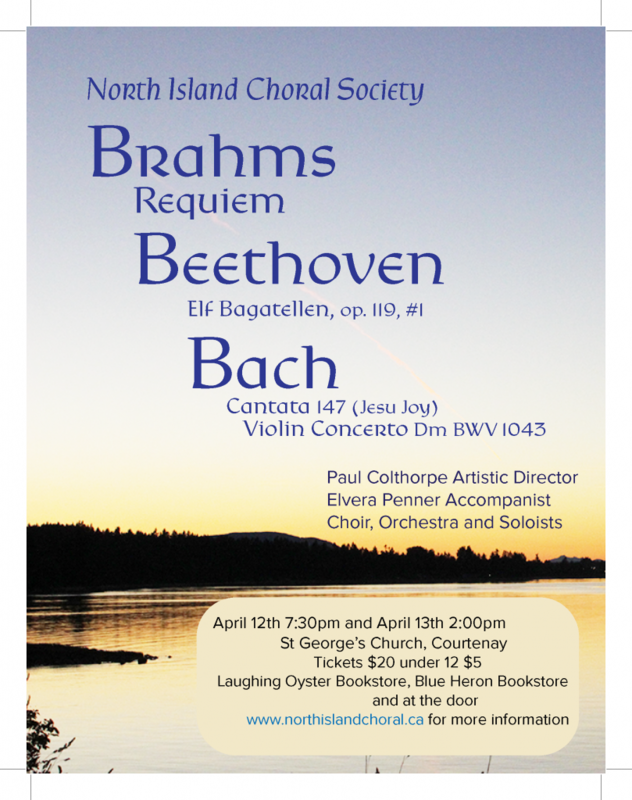 On Friday and Saturday April 12 and 13th, the North Island Choral Society, with a supporting orchestra of 25 musicians, will perform pieces by Brahms, Beethoven and Bach. The Concerto for Two Violins in D minor, #1 is one of Bach’s most famous works and is also known as the the Double Violin Concerto. The first movement, Vivace, will be performed by Isabella and James Donn on violin, accompanied by Wayne Donn on piano. The choir and their artistic director, Paul Colthorpe, with accompanist Elvera Penner, will present Johann Sebastian Bach’s Cantata No.147: Herz und Mund und Tat und Leben (Heart and Mouth and Deed and Life) is a church cantata, a medium-length narrative piece for voices sung in German with instrumental accompaniment. The opening by the choir is followed by arias and recitatives sung by the four soloists: soprano Carol Anne Parkinson, alto Lisa Stephens-Deith, tenor Brian Lawrence and baritone Christopher Bellamy . The music of the sixth chorale is the familiar Jesu, Joy of Man’s Desiring. The featured work is Johannes Brahms’ A German Requiem, to Words of the Holy Scripture. It is a sacred piece sung in German for chorus, orchestra, soprano and baritone soloists and Brahms’ consummate skills in counterpoint and rhythm are well-demonstrated. The solo parts of the requiem are performed by Parkinson and Bellamy. Their rich voices will complement the work of the choir, as will the accompanying orchestra. Please join us for a memorable afternoon or evening of wonderful music in celebration of the three Bs. The concerts are on Friday April 12th at 7.30pm. and on Saturday April 13th at 2.00pm, at St. George’s United Church, 505 6th St, in Courtenay. The North Island Choral Society began rehearsals for their winter concert “A Fantasy of English Carols” on Tuesday, September 4. This community choir provides a unique musical opportunity for singers of all ages in the Comox Valley to join for the love of classical music with no auditions to cause anxiety! Its repertoire covers a broad range of classical choral music, generally involving 80 singers, a supporting orchestra of 20-25 musicians and up to 5 soloists, ably directed for the past 24 years by Paul Colthorpe and accompanied by Elvera Penner. A Fantasy of English Carols Poster. Click to download a PDF version. The repertoire for our upcoming winter performances can be termed “A Fantasy of English Carols” or a collection of seasonal songs in free form. The works chosen by Colthorpe for this concert are truly a collection of fantasia by four well-known English composers of the 20th century: Benjamin Britten, Gustav Holst, John Rutter, and Ralph Vaughan Williams. The Magnificat by John Rutter is a composition of seven movements based on the verses from the Gospel of St. Luke wherein the Virgin Mary learns that she is to give birth to Christ. In the words of Rutter, “it is a poetic outpouring of praise, joy and trust in God” which weaves a magical spell of peace. He combines Latin text with an English poem; Gregorian chants with Latin American elements to reflect the feast days of the Virgin which are celebrated with singing, dancing and processions. Soprano Carole Anne Parkinson is the soloist. A Ceremony of Carols is a choral piece by Benjamin Britten which consists of eleven movements with text in Latin and in Middle English based on poems from the 15th and 16th centuries. Many of the movements are written as rounds or call-and-response pieces; the Gregorian chant in unison marks the beginning and end. The parts range from upbeat and festive to reverent; quiet and soothing to dark and foreboding. Soprano soloist Sophie Simard will join Carol Anne Parkinson for this work. Some five years before writing The Planets, Gustav Holst wrote Christmas Day, a choral fantasia of old carols. He makes use of familiar tunes such as God Rest Ye Merry, Gentlemen and The First Nowell in combination with the Old Breton Melody and Good Christian Men Rejoice to weave a festive piece of solo and choral parts with the central theme of rejoicing. Tickets are $20 , $5 for under 12s and will be available for purchase at The Blue Heron and Laughing Oyster bookstores at the beginning of November. Also from Choir members and at the door. 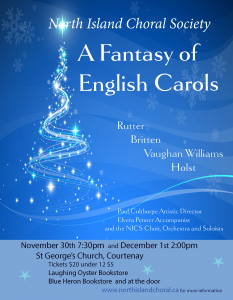 On Friday and Saturday November 30 and December 1, the North Island Choral Society, with a supporting orchestra of 20 musicians, will perform their winter concerts, “A Fantasy of English Carols”. A fantasia is a musical composition with a free form and one that is often based on several familiar tunes. It may also be composed of a mixture of different forms or styles. The works chosen by director Paul Colthorpe for this concert are truly a collection of fantasias by four well-known English composers of the 20th century: Benjamin Britten, Gustav Holst, John Rutter, and Ralph Vaughan Williams. The choir will be supported by accompanist, Elvera Penner, and the orchestra with choirmaster Corrine Innes, along with soloists Carol Anne Parkinson, Sophie Simard and Christopher Bellamy. The Magnificat by John Rutter is a composition of seven movements based on the verses from the Gospel of St. Luke wherein the Virgin Mary learns that she is to give birth to Christ. In the words of Rutter, “it is a poetic outpouring of praise, joy and trust in God” which weaves a magical spell of peace. He combines Latin text with an English poem; Gregorian chants with Latin American elements to reflect the feast days of the Virgin which are celebrated with singing, dancing and processions. A Ceremony of Carols is a choral piece by Benjamin Britten which consists of eleven movements with text in Latin and in Middle English based on poems from the 15th and 16th centuries. Many of the movements are written as rounds or call-and-response pieces; the Gregorian chant in unison marks the beginning and end. The parts range from upbeat and festive to reverent; quiet and soothing to dark and foreboding, making this another fantasia for advent. Ralph Vaughan Williams’ Fantasia on Christmas Carols is a choral tapestry of folk songs from southern England: The Truth Sent From Above, Come All You Worthy Gentlemen and On Christmas Night. It also features fragments of other well-known carols such as The First Nowell and a tune There is a Fountain. Please join us for a memorable afternoon or evening of wonderful music in celebration of Advent. The concerts are on Friday, November 30th at 7:30pm. and on Saturday December 1st at 2:00pm, at St. George’s United Church, 505 6th Street in Courtenay. Tickets are $20 and can be purchased at Blue Heron Books in Comox and Laughing Oyster Books in Courtenay. Tickets can also be obtained at the door. Tickets for ages 12 and under can be purchased at the bookshops and at the door for $5.